Over the past couple years we have seen a resurgence of the adventure genre that was extremely popular a decade and a half ago. While Telltale Games has been leading the front in the US, Pendulo Studios from Spain has been one of the few European developers driving the renaissance in Europe. Over the past couple years we have seen a resurgence of the adventure genre that was extremely popular a decade and a half ago. 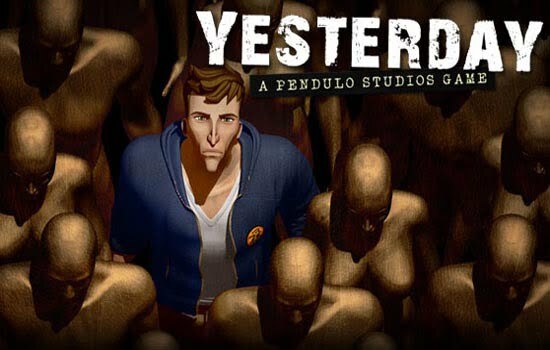 While Telltale Games has been leading the front in the US, Pendulo Studios from Spain has been one of the few European developers driving the renaissance in Europe. After developing the million selling 3-game series Runaway, they decided they want to do a game that was a bit darker than their normal comedic style. That darker title is Yesterday and it will be published by Focus Home Interactive for PC at some point in 2012. The game opens with your typical serial killer hollow with candles, wall drawings, pictures, and demonic imagery. Yesterday then follows Henry White, rich kid gone volunteer for a charity that advocates for the homeless in New York City. Henry and his fellow volunteer slash friend Cooper are going around to known homeless habitations and warning the economically challenged individuals of the threats against them. The cinematics are heavily stylized comic book style 3D while the actual gameplay takes place in a more cartoonish albeit still 3D style. The voice acting is missing in the preview build, probably due to localization being done late in most game cycles. Henry enters an old subway tunnel that had collapsed to look for vagabonds that might need to be serviced or in need of his services as an advocate for the homeless. He decides to leave his old buddy Cooper in the van. Once you gain control of Henry, you point and click at objects and Henry kind of warps to them and you receive a little information on the object and sometimes can pick it up and use it. Like most games in this genre, you will end up with a hoarders treasure trove that will eventually be used in a MacGyver like fashion to pass puzzles. The first puzzle of the game has you using a cable wrapped around a load bearing column and tied to a suit case under some rubble. You then use a pipe to start twisting the cable on the other side of the column to pull the suitcase out of the rubble. Cutting a soda can and turning it into a key for the padlock blocking Henry’s way is the next puzzle leading Henry into a room full of posed mannequins. Sometimes the puzzle solving is just not as straight forward as it might be in other titles and that is ok. Gamers need to stop being babied. Henry is snuck up upon and knocked out. When he wakes, he is being held hostage on his knees with one dude behind him and another on a pedestal treating the scene like a cross between something religious and a court room trial. During the cut scenes Henry is given dialogue choices that affect the game and eventually must determine chess moves to prove his intelligence to the homeless. I don’t want to give away too much more of the gameplay suffice to say that Cooper will come into the picture and third playable character further in the story. Overall, Yesterday looks to be shaping up to be a solid and entertaining point and click title. The settings and plot in the preview build are entertaining and graphically it is nice on the eyes. The gameplay mechanics are the same ones used in 99% of the genre. It is definitely a title fans of the genre should be looking for.